This month the block we are making is called Broken Berries. We are adding one new fabric design and taking away one from last month. For those of us living under a blanket of snow these are a delight to work with. Such happy colours. 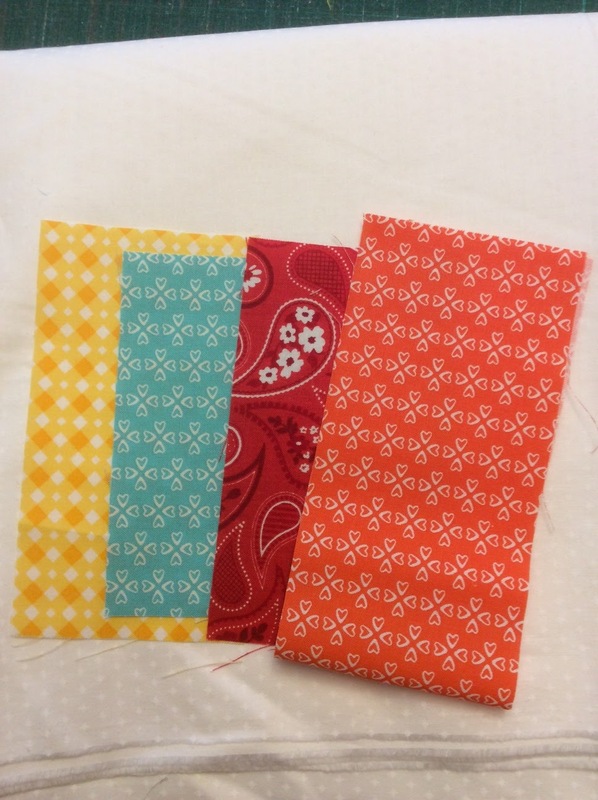 The fabric from the Fat Quarter Shop is fabulous. 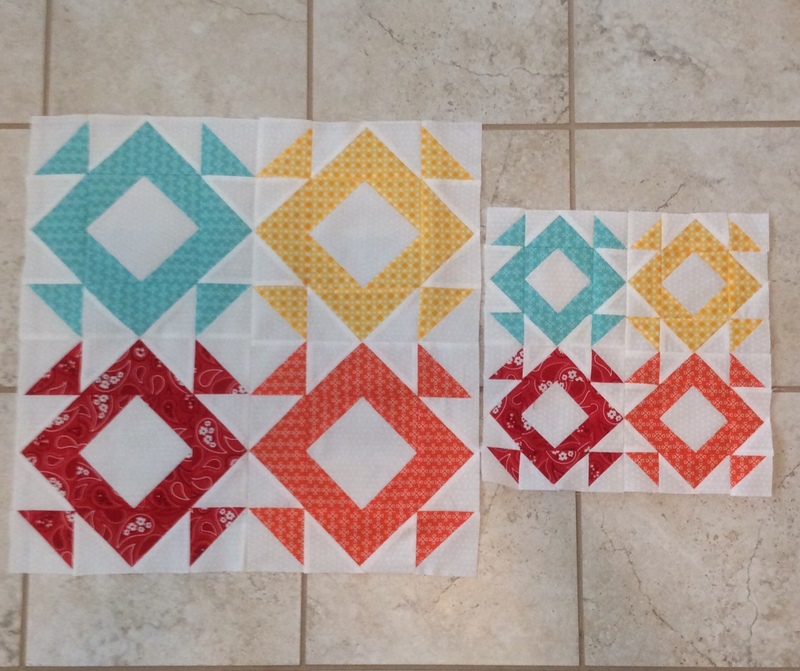 The block components are straight forward, clearly illustrated and ones you are likely used to making. I hope that you are saving your bonus triangles. I am generating a goodly number of them and have not as yet stitched them into actual HST's but they are contained and ready to be my next Leader and ender project. 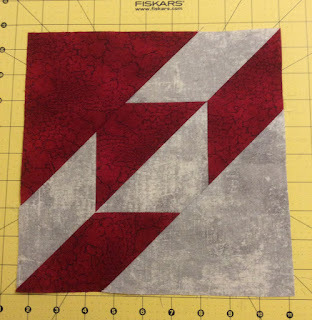 If you follow some of the other bloggers who are working on this Quilt Along you may have seen the little Valentine purse made by Pat from the Scrapatches Blog (here). 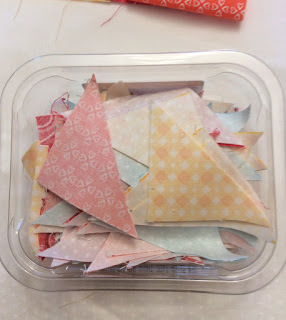 She used her smaller bonus triangles for the project. so far I am generating two different sizes and have just put them all together in my next Leader/Ender container. And these are my two Broken Berry blocks. I would encourage you to join in. Make a donation to St. Jude's Hospital. We don't have that particular hospital in Canada but we do have Hospitals like Sick Kid's in Toronto that fulfil a similar purpose. The work they do is amazing and has been for years. 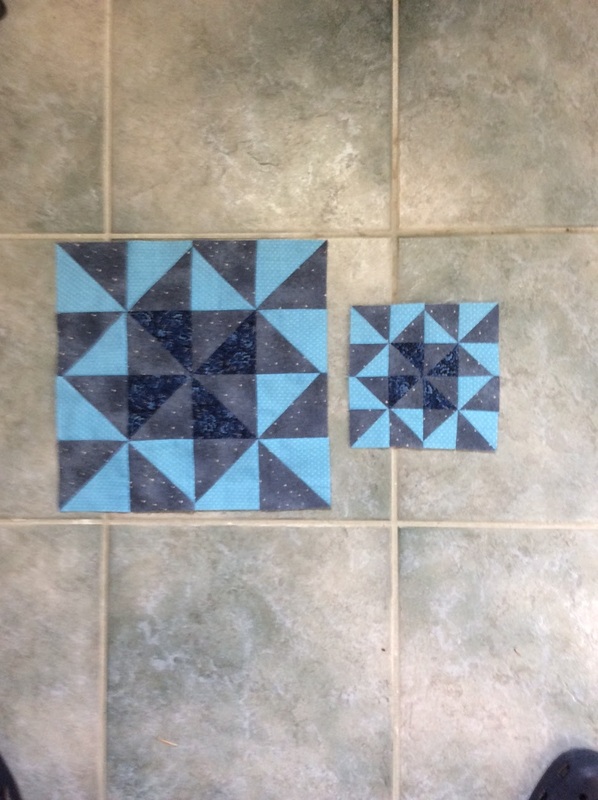 The newest Classic and Vintage Quilt Along being offered by the Fat Quarter Shop is the Hunter Star block. 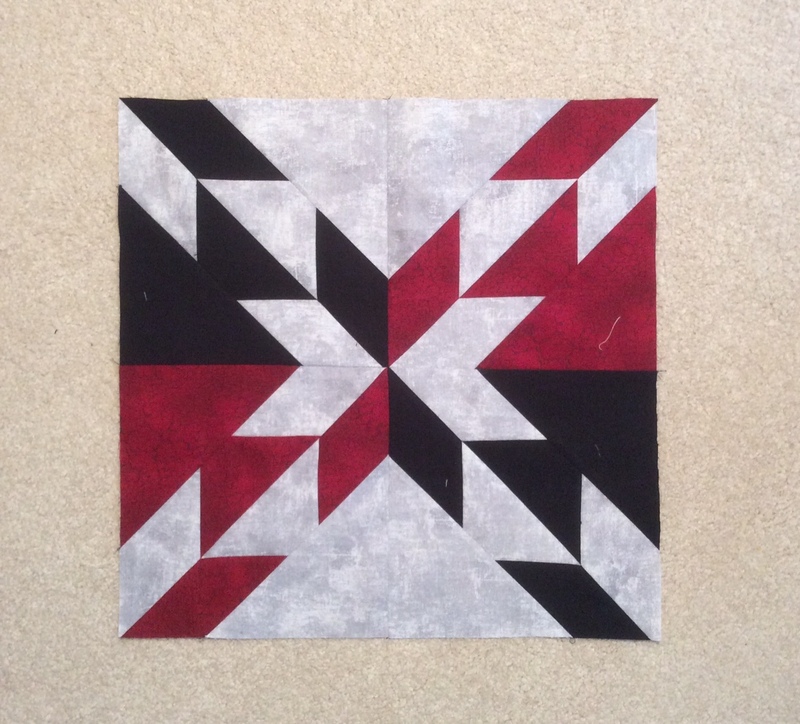 Several participants have made a block and several others have made a functional quilt. This particular pattern has been designed to be done "scrappy". My favourite way of working. I have made this block before with specialty rulers but never just by piecing so I was anxious to see how it would turn out. I selected a light textured grey for my background colour and a textured red for my accent. I was really pleased with how this turned out. Pressing directions are provided that result in all kinds of nesting situations and that helps with making nice crisp intersections. 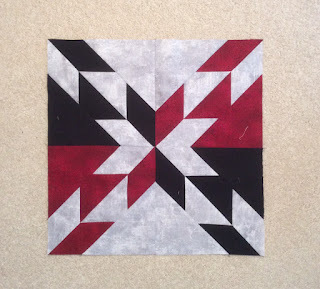 In fact I was so happy with this that I made another red block and two black blocks. As we head into the shortest month of the year we only have 28 days to enjoy our blue blocks this month. For some that will just not be enough. I hope you got a chance to make at least Jen's blocks if not some of the other blocks that the Blog Hop crew is offering. I am on the hop to support and enjoy Jen who is a talented, young hard working individual. And I would like to see her succeed. Again this month I made one 12" block and one 6" block. They went together quickly and help reinforce the importance of value in a block. Karen Combs was the first designer I heard say "Value does the work and colour gets the credit". So true. Before you leave your reds behind in a safe place so you can find them in December when it is assembly time, think about cutting one 2 1/2" strip the Width of Fabric. You may want a scrappy binding when all is said and done. Have a great February. We have a couple of birthdays this month as well as a non-birthday. My hubby is now much younger than I am. And one last important note be certain to visit the other bloggers on the hop. Several of the designers are offering alternative blocks. Dionne's applique bear last month was a delight. Here is the list.